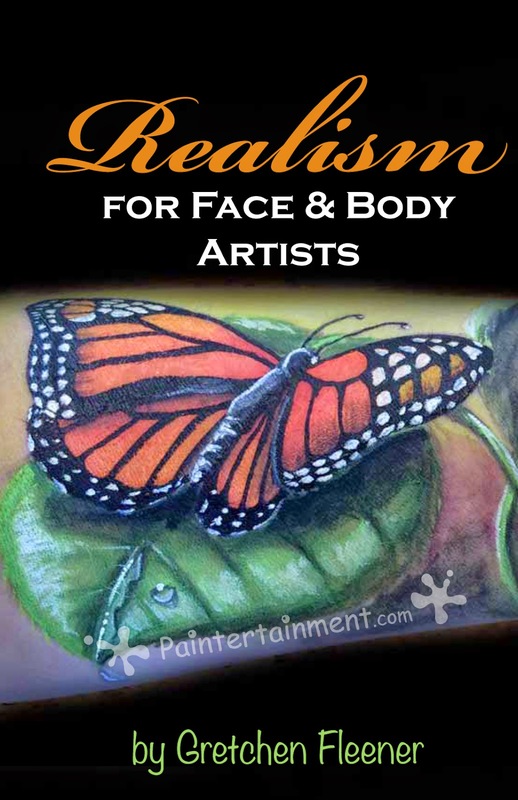 New Book, "Realism for Face and Body Artists" NOW SHIPPING! My new book is HERE! I'm so excited to finally have physical copies of this book that I've poured the last year of my life into and am even more excited to share it with all of you! 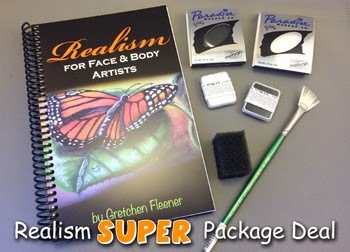 "Realism for Face And Body Artists" is unlike any other face painting book on the market today. 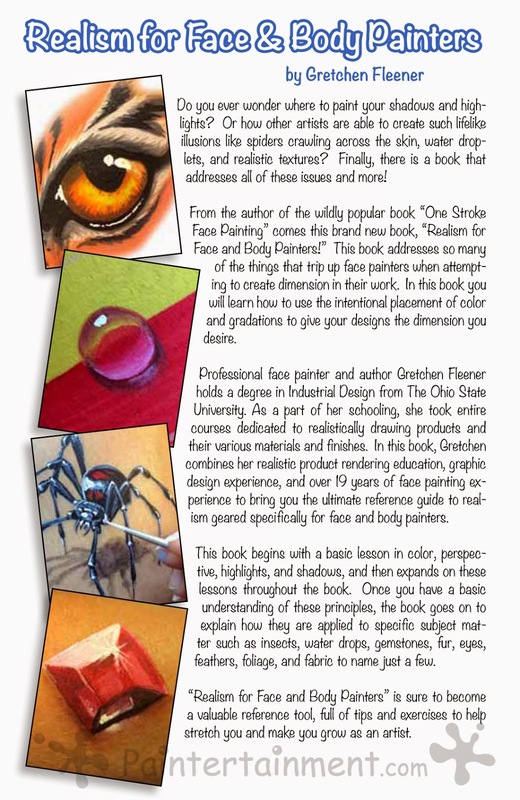 The book is a huge visual reference manual of subject matter that face painters commonly struggle with. 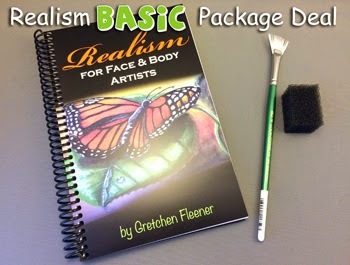 I look at this book as being like a week full of workshops on realism, only at $29.99 it costs a tiny fraction of the price, you can learn at your own pace, and you can take a full color copy of the course materials with you wherever you go to reference at any moment. 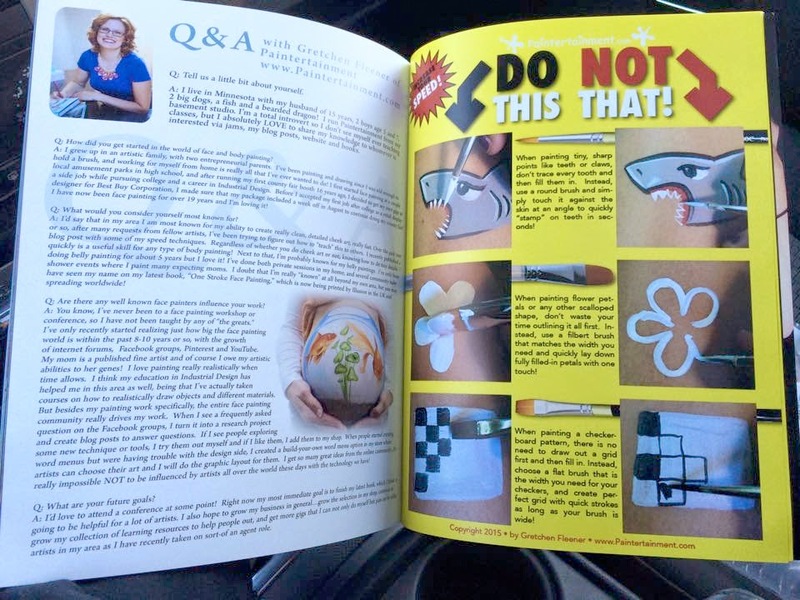 This book is designed for artists who crave something beyond step-by-step designs and are looking for more broad artistic instruction that can be applied to anything they paint. 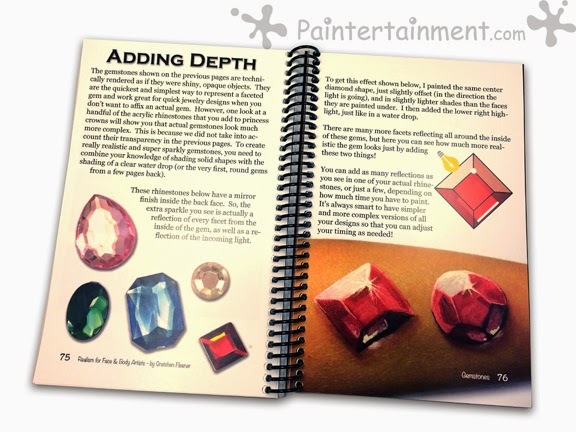 It starts out with some basics of color, shading and perspective, and then expands with over 160 full color pages of tips, tricks and instruction to help you achieve more realistic water drops, fur, plants, beaches, fabric, eyes, gemstones, and a LOT more! With over 450 full color photo, the book not only covers how to paint these different things, but also suggests ways to experiment with and study objects and lighting in real life, helping you gain a better understanding of the principles behind the tips and techniques. This book is PACKED with content!! Hair: adding highlights and shadows to hair...great for mermaids and princesses! Right now this book is ONLY available HERE on Paintertainment.com. I do hope to have it available at more retailers in the near future in the US and overseas, and will be sure to let you know via our Facebook page when it is! In the meantime, you can find it here! 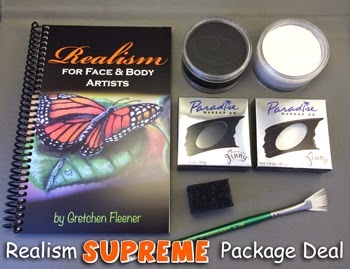 We also now have several great package deals that include the book and some of the key tools you'll find used in the book: a rake fan brush, stipple sponge, and both glycerine-based and wax-based black and white paint! There are three packages available, and all of them will save you money! Check out these package deals here! 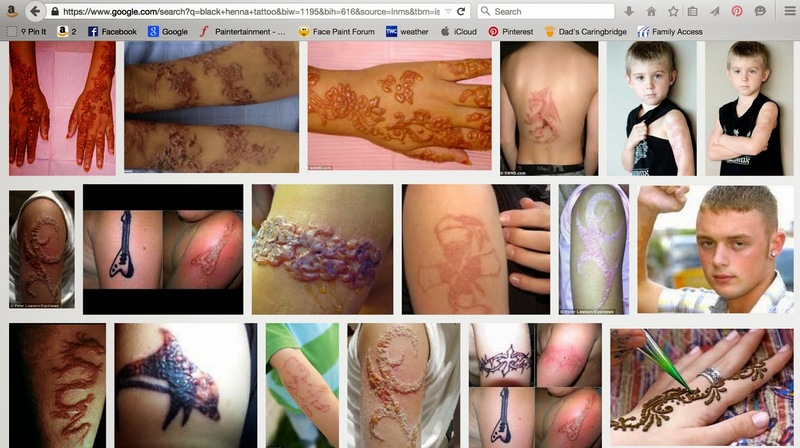 Google image search of "black henna tattoo scars"
It really is difficult to even look at. Nobody wants to imagine their child with a reaction like this. The sad thing is that the majority of these people are not those who weighed the risks and decided to live dangerously and go for it anyway...these are people who innocently trusted a henna artist whom they thought was professional and safe, only to end up scarred for life by an experience that was meant to be fun or to commemorate a happy occasion. 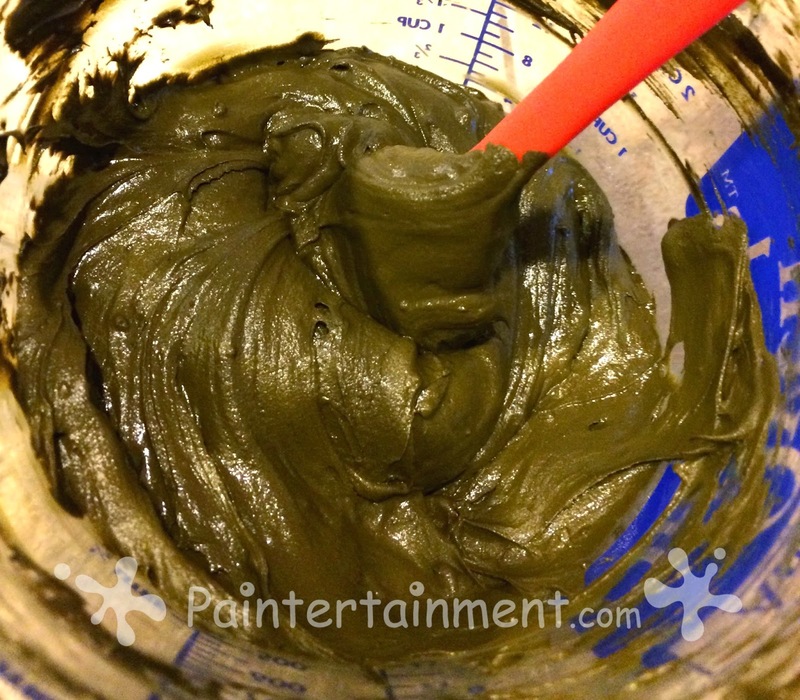 Fresh, natural henna paste: Henna powder, lemon juice, sugar and essential oils. Having my foot done by the fabulous Lisa Seltzer. Note the color of the paste. Freshly applied paste that I did on my own hand...it starts to darken as it dries but generally it should brownish. 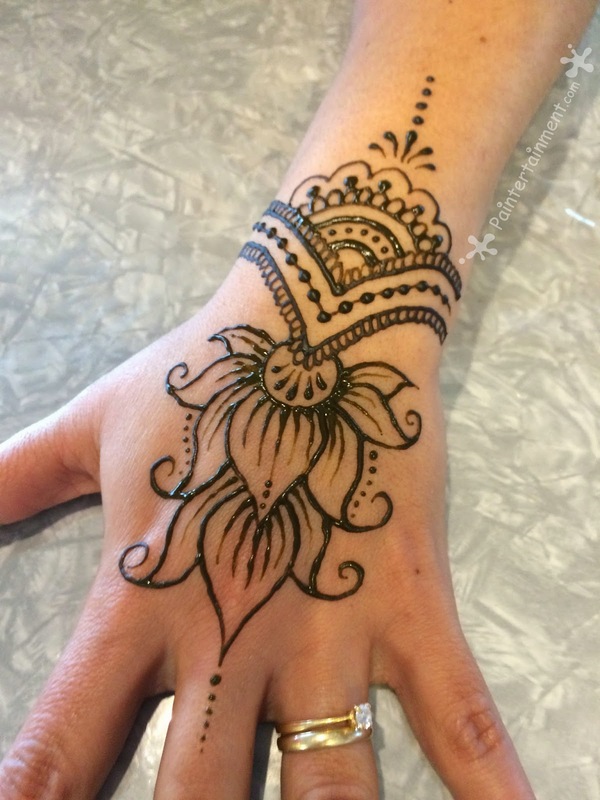 So what's so bad about black henna? Black henna contains para-phenylenediamine, also known as PPD, a chemical found in commercial hair dyes. It is NOT intended for use on skin. PPD, when directly applied to skin, can cause allergic reactions resulting in itching, redness, blistering and scarring. However, many henna artists mix it into their pastes, with a much higher concentration than you'll find in hair dyes, in an effort to darken and lengthen the stain more. But I had a black henna tattoo and I'm fine! 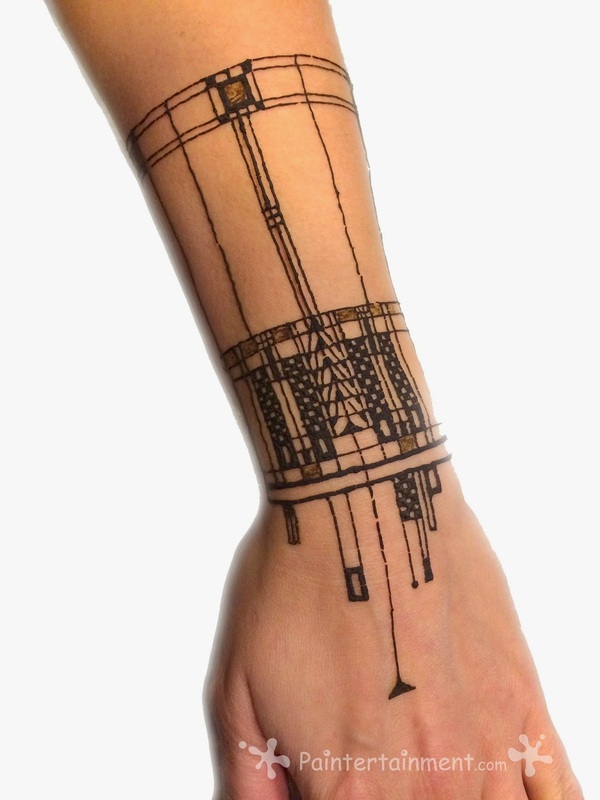 Many people, when finding this out may think, "I had a black henna tattoo on our vacation but thank goodness it didn't swell up and I didn't have a reaction! I must have lucked out!" 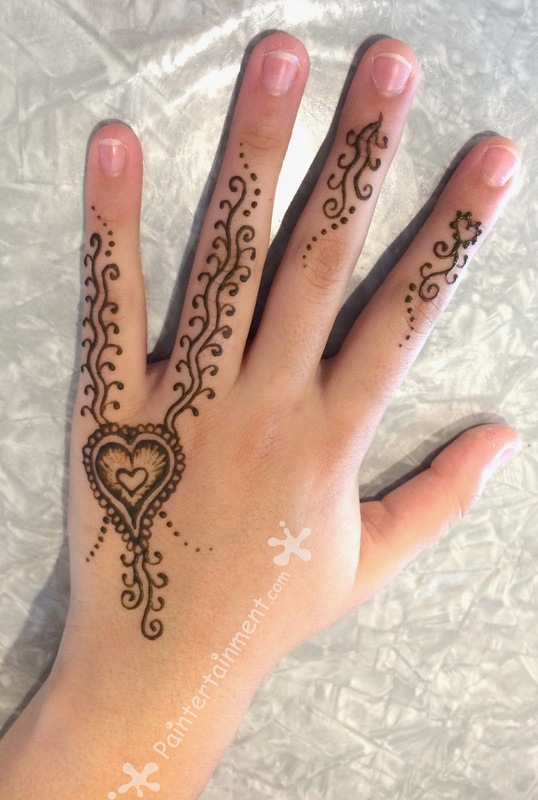 However, it is important to note that even if a person doesn't see any adverse visible reactions to a black henna tattoo, they can still have an anaphylactic reaction decades later if they decide to dye their hair. Exposure like this to PPD can cause a sensitivity to hair dye that can last a lifetime. In one recent very sad and extreme case, 39 year old wife and mother Julie McCabe had an anaphylactic reaction to her hair dye years after having a black henna tattoo in Dubai, went into a coma, and later died. Less severe reactions can cause the design to blister, turning a temporary design into a permanent scar. How do I protect myself and my kids from black henna? Be observant. Before you ever agree to have a henna tattoo done, observe the artist. What color is their paste? It should be a light or dark brown color, not black. Look at the photos they have on display of actual work they have done. Is the paste black? What does the final stain look like? 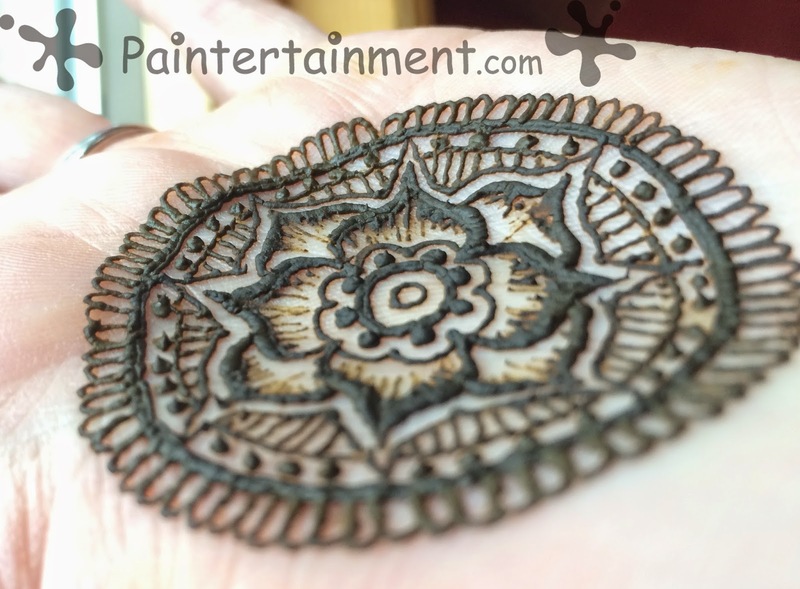 A safe, natural henna stain should be an orange color immediately after the paste is removed, darkening over the course of a few days to a brown or burgundy color, not black. Ask questions. 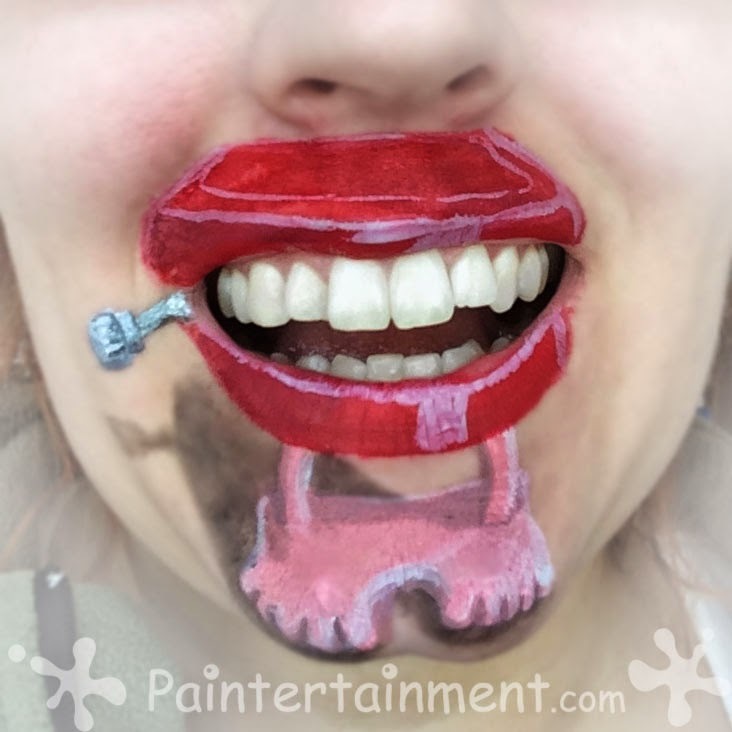 The most important thing you should do is ask the artist what ingredients are in their paste. Ask them flat out if they use only natural henna or if they add PPD or any other chemicals to their paste to enhance color. You have a right to know what they are putting on your body! A safe henna artist will most likely praise you for doing your research and asking them what is in their paste!If their answer, attitude, or body language makes you uncomfortable, go with your gut and keep walking. NO henna tattoo is worth scarring your body or risking an allergic reaction later in life. Unfortunately seeing the word "natural" on their marketing materials does not mean that their paste is PPD free either, as this poor 6 year old boy found out the hard way. This is why it is important to ask specifically what ingredients are in the paste, and to ask specifically whether there is PPD or any other chemicals. Educate your kids. 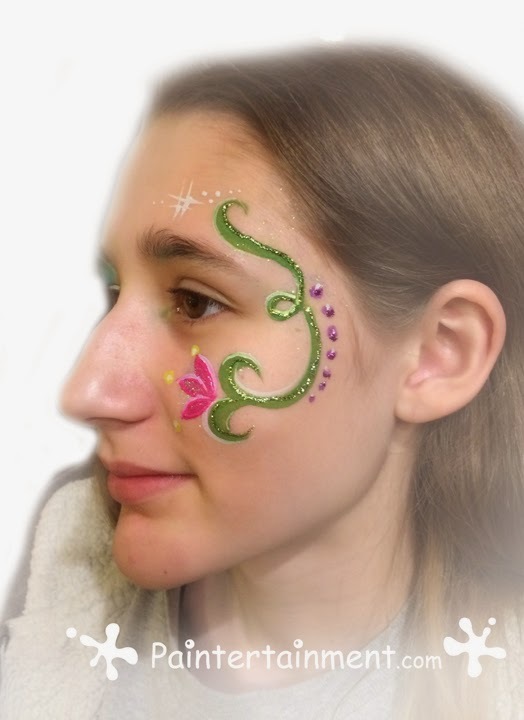 Chances are your kids will come across henna, whether it be on spring break or a class party in their own school, and you won't be there to investigate for them. 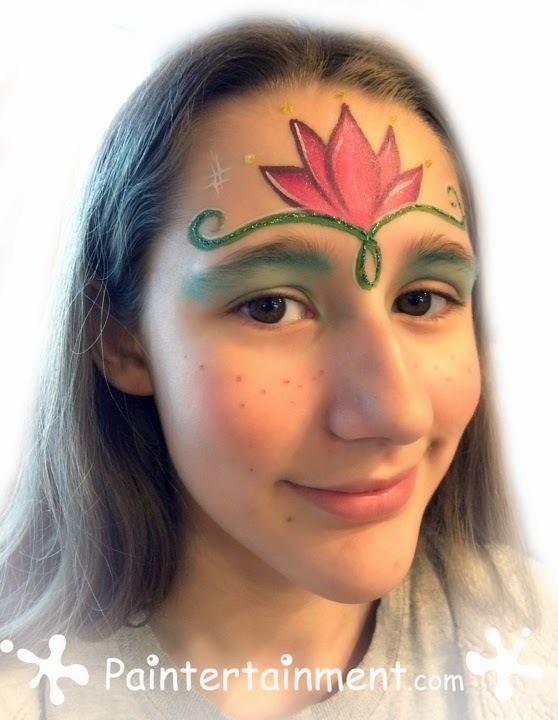 Again, right in my own backyard, 35 8th graders were sent to the ER with reactions to black henna tattoos they received at their 8th grade graduation party in 2011! Ideally this article has reached you before a black henna artist has, but even if you have already been exposed, my hope is that you now know to stay away from hair dyes in the future, and pass this on to help educate and protect others. Thank you for taking the time to read this post and protect yourself from negligent artists and naive event planners. Who knows, it could save you from a visit to the ER, or even save your life! I hope you're all having a great February! 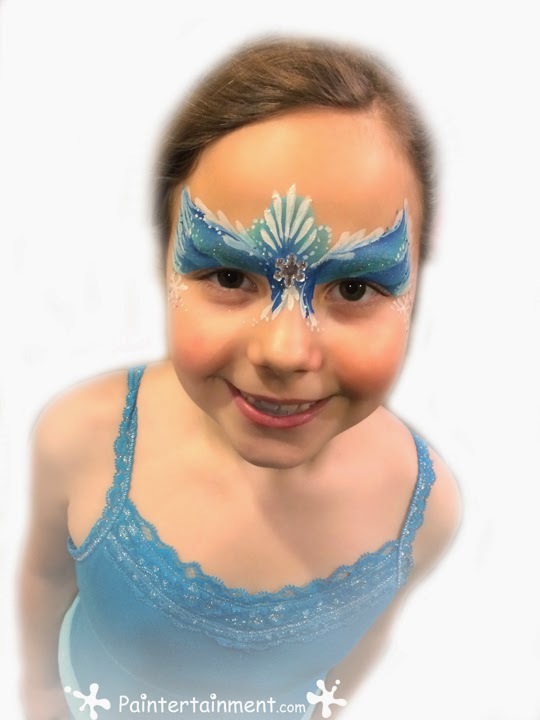 I know I've seen a lot more requests coming in for face painting again this month. Spring is coming and so are more gigs! I thought I'd post a few photos from the past few weeks. If you follow us on Facebook you've seen these, but here are some of the things I've been doing lately! Sometimes I forget to update my blog so here it is, for you non-Facebookers! I LOVE jamming with my fellow local artists! I seriously wish I could do it several times a week, but alas...other duties call as well. Every time we get together I learn something new. 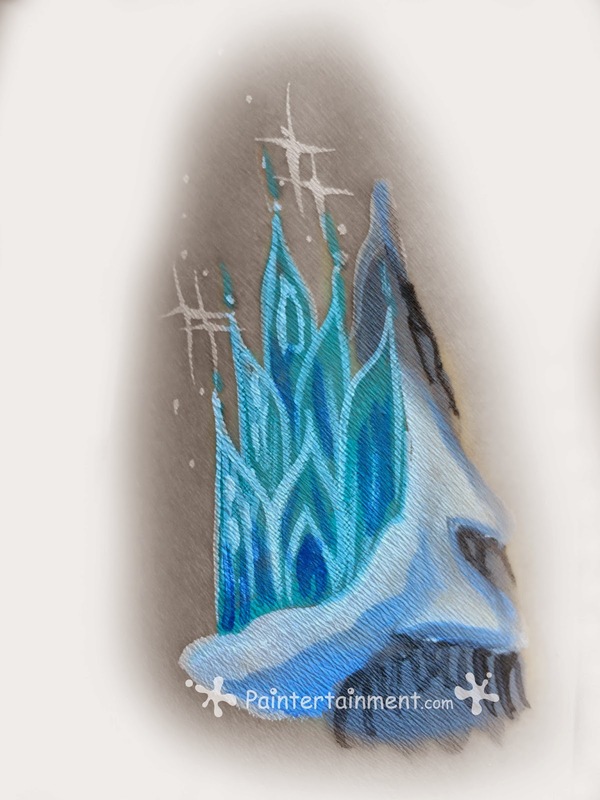 Check out this awesome idea, for example...this is a snowflake button that can be used as a stamp! 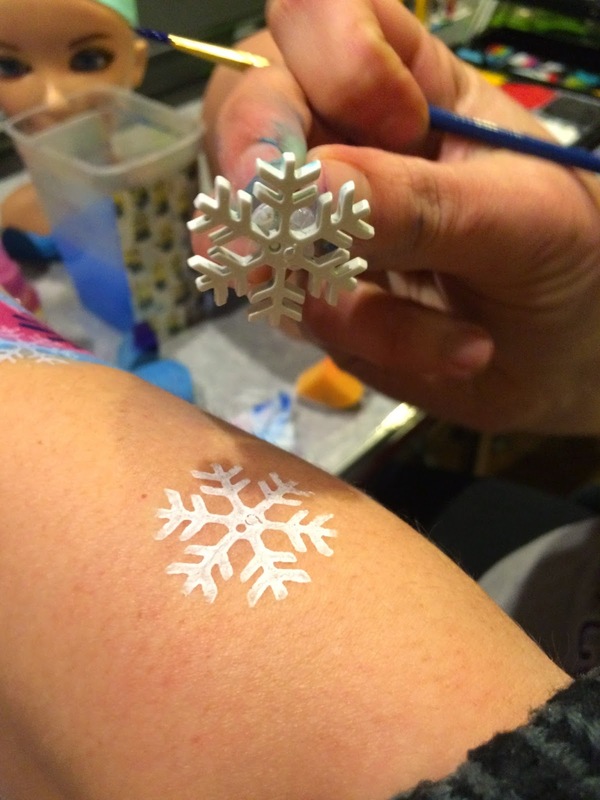 Just dab it with a paint-loaded sponge and stamp out perfect snowflakes. A friend got this in a goodie bag at an event she attended...what a great idea. I have a trip to the fabric store on my to-do list now! The next day I did a little experimenting with Baymax on my boys! It was my little guy's idea to add the lollipop in his hand...now I'd like to re-do that one but plan for it better, and have a fist sticking out holding it. I think I found this one on Pinterest?? This was the first design I had done on myself at the Polar Sling henna gathering a few months ago by the wonderful Angela Aspeslet! It's been chosen by a couple others who have seen it in my practice book and always turns out pretty. I was also super honored to be featured on 6 pages of the February issue of Skin Markz magazine! How exciting!!! They published some of the content from one of my recent blog posts on achieving speed in cheek art. 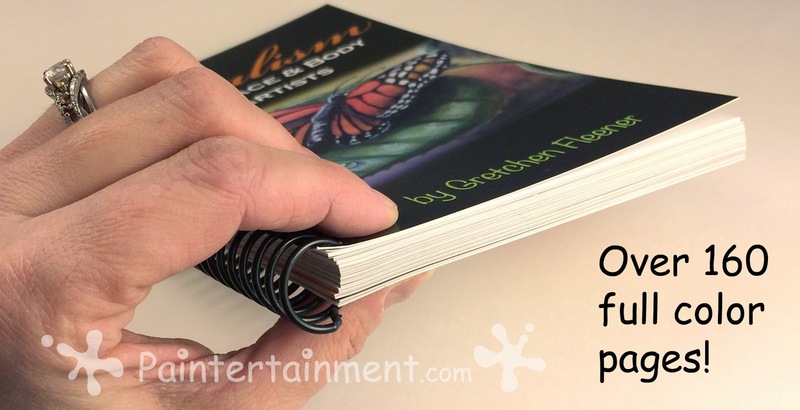 Like my previous One Stroke Face Painting book, this one will be coil bound. So, it will lie nice and flat on your tabletop while you work, making it an easy reference. Keep an eye out here on my blog and/or Facebook page to find out as soon as it's available to ship! Once it is, you'll be able to purchase it here. New Package Deals & Stencils Now Shipping! We have a few new items in the shop that I wanted to let you know about! I'm super excited to finally be carrying Lea Selley's wildly popular Graffiti Eyes stencils! 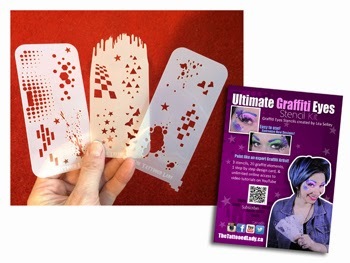 So far we have the Ultimate Graffiti Eyes Stencil Set, but do plan on carrying the others in the coming months. $28.00 buys you three stencils packed which 20 different graffiti elements, as well as several step by step idea cards to get you started. I love how durable these stencils are, and how fun and easy it is to layer them and incorporate them into so many design ideas! We also have TWO new package deals! 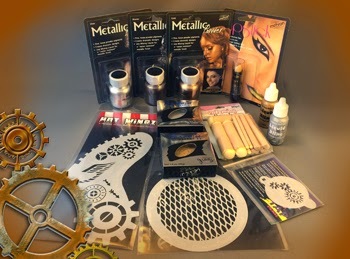 The first is the "Ultimate Steampunk Package Deal," which includes 3 of Mehron's metallic powders, Paradise Brilliant silver and gold makeup, gold lipstick, three must-have steampunk stencils, gold and silver Liquid Bling, AND a 16 piece dauber set. These daubers work great for adding quick screw heads! Simply load with your gray or other metal color, add a touch of a darker shade on one corner, press and twist. Perfectly uniform, round, and 3-D looking screw heads every time! The items in this package individually add up to $81.98 but the package deal is only $74.99, saving you $6.99! Our 2nd new package deal is this fun "Springtime Package Deal!" 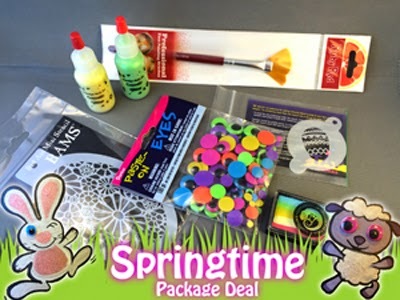 This one comes with all sorts of fun springtime goodies... Ruby Red's butterfly fan brush, yellow and green cosmetic glitter, a BAM flower stencil, TAP Easter egg stencil, a bag of fun neon google eyes, and a Cameleon "Jellybean" Colorblock split cake! The items in this package individually add up to $39.40, but the package together is just $34.95, saving you $4.55! 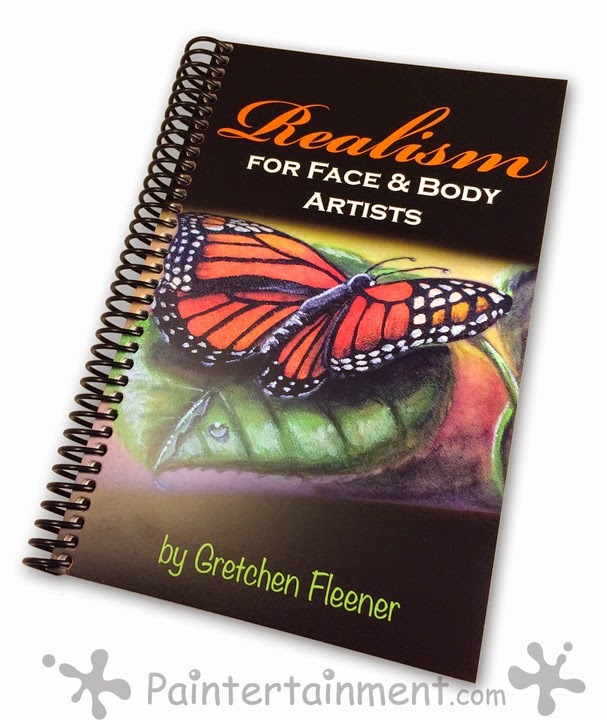 Stay tuned to our blog and Facebook page as my new book "Realism for Face and Body Artists" will be in stock THIS WEEK and ready to ship! I can hardly contain my excitement! :-D We also should have a new e-newsletter coming out soon as March is less than a week away!